At St. Bernard we have two entrances-one at the front of our campus near the intersection of Bower Hill and Washington Road (and the church next door) and another at the back of our campus on Scott Road. During weekend Masses, parking is also available along Washington Road. Handicap accessible spaces are available in our upper lot near the rectory and Fontenay Center. We also have a cart available to drive you to the nearest accessible entrance. 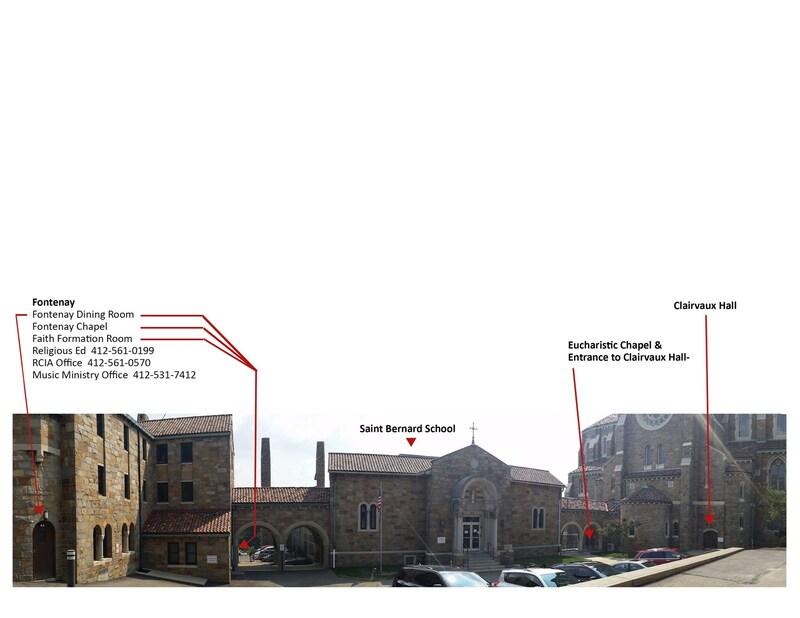 Our accessible entrances for the church are along Washington Road on either side of our main, front door entrance. If you need assistance, look for someone with a St. Bernard name tag. a Catholic Mass before, you will be familiar with the liturgy. Worship aids are located in the pews. We welcome everyone who visits us at St. Bernard regardless of background or belief. You are a guest and we are here to help you to feel at home with our parish family.